Beach Break is a uniquely renovated, relaxed and light filled, contemporary home, retaining all the charm of a traditional beach house. Bordering Murramarang National Park and located on Murramarang Beach, this house is the epitomy of the laid back lifestyle. It boasts a number of different zones, both interior and exterior. There are two living areas, two sleeping wings, two bathrooms and a large new kitchen and dining area. The front deck is oriented to the beach and the back deck offers a delightful bush feel with mature trees and native plantings. Easy walking access to three beaches, and numerous other beaches are less than a five minute drive. Excellent surfing. Beach fishing and boating around Brush island. There is also beach walking bushwalking for all standards in the surrounding coastal and hinterland National Parks. 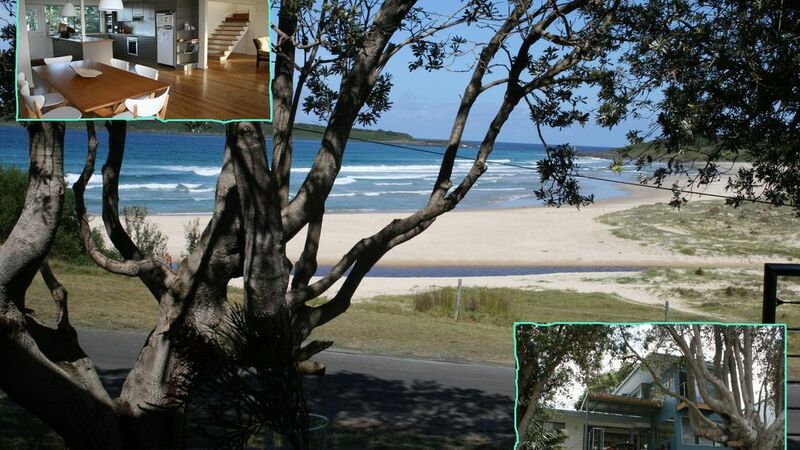 - 20 minutes to Ulladulla and 25 minutes to Batemans Bay. Please note that linen is NOT supplied at this property. Cooking oils, vinegar, a range of spices, sugar, salt and pepper, stock cubes. In dining room buffet; plug visible. We had a lovely six days at Bawley Beach Break, the view was just fantastic and the house was pretty well-kitted out in the kitchen. We spent a lot of time sitting on the deck watching the waves, really beautiful outlook. I will definitely be staying at this property again, and will recommend to anyone. I think my friends and I ran around the house for half an hour looking through all the rooms and couldn’t believe how big the property is. The main bedroom is a main highlight, you are able to lay in bed whilst watching the ocean all morning and can even hear the waves crashing from all the rooms. The owners made everything so easy and we didn’t have any problems at all. A friend recommended this property to us and said it was the BEST coast house ever - she was right! A friend recommended this property to us and said it was the BEST coast house ever - she was right! We arrived in darkness so it wasn't until the next morning we realised the beach was literally just across the road. We had a mix of adults and teenagers, so the split level suited us perfectly. The house was spotlessly clean on our arrival, and had everything we could have wanted, with lots of little useful extras. The owner was very easy to deal with and we all agree this was our best holiday ever. Would definatley come back and have already recommended the house to others. We went down as a group of 3 couples for a weekend and had the most amazing time. The house is lovely, right on the beach, beautiful kitchen, amazing renovated bathrooms and best of all - a wood fire! Bawley is great - surf breaks are awesome, and lots of beaches to explore on long walks! I have recommended this house to all my friends, and will definitely be going back again!